True crime writers take a murder case and explore it from beginning to end, going into great detail about the partipants, their actions, and their motivations. It takes a mountain of research to make sure all the facts are correct. Otherwise, they would likely face a lawsuit. Some do anyway. Mystery fiction writers take an actual case and change enough of the facts that they can say whatever they wish without getting into trouble. That's what I did in my first Greg McKenzie novel. I wanted to saddle Greg with a recent troubled past. I had him quickly tire of retirement and take a job as an investigator for the district attorney in Nashville. I needed something that would get him fired from his job, plus anger many in the police department. I picked a case that remained unsolved but was in and out of the news on a regular basis. A young lawyer had reported his wife, a talented artist, missing two weeks after she supposedly left home for a "12-day vacation" following an argument. Her friends said she would never leave her young son and daughter like that. The police quickly targeted the husband but were unable to find a body. I changed the husband to a CPA and the wife to an interior designer. They had only a young son. But I kept most of the circumstances of the police search and their concentration on the husband as the murderer. In the real case, the wife was the daughter of a prominent local attorney, who sided with the police in believing his son-in-law guilty. I made the missing wife the daughter of a prominent banker, who was the chief backer of the district attorney. When my protag, Greg McKenzie, makes some off-the-cuff remarks quite critical of the lead investigator, they turn up on the front page of the newspaper. The wife's father is infuriated and Greg gets fired. Long after my book was published, the actual case reached a conclusion when the husband's father turned on him and testified he had helped dispose of the wife's body. The story was told in a true crime book titled An Unfinished Canvas, by Nashville author Phyllis Gobbell and Michael Glasgow. Fictionalizing fact is a much simpler operation. Of course, Nashvillians who read my book recognized the similarity to the Janet and Perry March case. After his conviction in August of 2006, March was sentenced to 56 years in prison. I can't tell you what happened to the young CPA in Secret of the Scroll. That would be a spoiler. When I started writing The Surest Poison, I set up my protagonist, Sid Chance, as a former Metro Nashville cop who got shot in the line of duty and, after recovering, took a job as police chief in a small town south of Nashville. I had him divorced by a wife who couldn’t take the stress of wondering if her husband would survive the next shift. After I was a few chapters into the manuscript, one of my critique group members made a remark that struck a nerve. She said she was tired of reading about all the PIs who were sama-samo wounded ex-cops pining over a lost love. Back to the drawing board. I looked at the plot, which involved a toxic chemical spill behind a plant in a rural area. What kind of background would make a guy really concerned about such a situation? I also needed him to be trained in law enforcement so he would qualify for the police chief job. In doing research for Designed to Kill, my second Greg McKenzie mystery, I had interviewed a ranger at the Gulf Islands National Seashore on Perdido Key, FL and knew they were graduates of the Federal Law Enforcement Training Center near Brunswick, GA. I had my answer. Sid Chance became a veteran National Park Service ranger who was wounded in the line of duty after 18 years on the job. He became a rugged outdoorsman who had earlier trained in living off the land as an Army Special Forces soldier. I did away with the wife and left him a lifelong bachelor. As the story developed, a key part of the plot involved his experiences as chief of police in the fictional town of Lewisville, TN. I covered that facet of his background extensively. His role as a Green Beret in Vietnam merited a few mentions, with one relevant incident recounted. Sid’s ranger job provided only a couple of peripheral details, mainly as motivation for his intense interest in the pollution case. In the next book I will develop his background as a National Park ranger as part of the plot. All I know at this point is that he was shot while working on an inter-agency drug operation. Since he had a reputation as something of a maverick, some of the higher ups took advantage of the opportunity to rule him unfit for duty because of the injury. That was when he applied for the police chief job. Before I get to that, I need to make a journey to Gatlinburg and interview a ranger at the Great Smoky Mountains National Park headquarters. I get an email newsletter called Investment University, which is a free publication of The Oxford Club, an investment advisory service. In today’s issue, Investment Director Alexander Green writes about “What It Means to Be Truly Rich.” The part I found particularly interesting described a book that came out a decade ago titled The Millionaire Next Door. According to Green, the authors spent years studying the lives of “everyday millionaires.” He observes that one out of eight households in the U.S. has a net worth of over a million dollars. Of course that includes bank and investment accounts of everyone in the home, the value of the real estate, automobiles, and any other property held by the occupants. When you get out a sheet of paper and start writing it all down, you’ll probably find you’re a lot better off than you thought. I just finished that exercise. What I found is that we’re not anywhere close to being a millionaire household. Nor even a half-millionaire family. But we have enough to live comfortably and buy the things we really want and do the things we like to do. It helps that our tastes are simple. For example, we don’t like crowds so had rather watch sports on TV. We enjoy eating out but avoid the more expensive restaurants. Looking down the list, we were doing fine on the first point until the stock market began its plunge. As for the second, we’re past the wealth-building stage. Preservation of what we have is most important now. We’re right on with number three. And number four. Regarding number five, we have six children between us, and only one is not self-sufficient. Five out of six ain’t bad. On point number six, I’ve wandered down some dead-end paths on several occasions, but I’m becoming more proficient now. Finally, for the coup de grace, I’m sure those millionaire households weren’t occupied by mystery novelists. Fortunately, I didn’t really get into mystery writing until after I retired. However, I didn’t choose well enough to achieve millionaire status by that time, either. Alexander Green concludes the authors “discovered that your net worth is mostly a result of the choices you make.” Since I don’t believe in luck, never having had any, I could have told him that to start with. Anyway, I believe being “truly rich” means knowing how to live life to the fullest with what you have. What’s your take on it? Readers, and writers, too, have always wondered where the characters and their stories come from that seem to magically appear as our fictional creations stream out onto the computer screen or come to life as blobs of ink on paper. Interestingly, not all people can do this. It is usually ascribed to a nebulous notion about something called a talent for writing. I have a confession to make. Some time back I held the winning ticket for a lottery jackpot worth several millions of dollars, even after being drastically cut for a single payout and reduced further by the IRS’s unseemly slice. After quite a round of negotiation with the lottery folks, I got them to award the prize to a fictitious name (sort of a nom de flam, as in flimflam). I convinced them that I intended to use the money for a research project that might easily become skewed if it became known and was linked to me. The Odyssey Project, as it was called, brought together top flight minds in the fields of psychology and sociology, specialists in behaviorism, motivation, and human development. Their task: to locate the source of the fictional experience. The name Odyssey was chosen for obvious reasons. Homer’s tale of Odysseus and his heroic struggle to return home from the Trojan War is one of the earliest classics of imaginative fiction. It is both inventive and inspiring. Little is known about the writer, but it is believed that he was a blind bard. He gave us something to shoot for. The researchers conducted hundreds of interviews with authors, never revealing their true intentions. You have no doubt read many of them which have appeared in both print and digital versions online. Others, in collusion with medical practitioners, studied the physical and mental makeup of writers around the country. Some, masquerading as sleep clinic personnel, did research on brain waves of sleeping authors who reported they had taken whole plots from their dreams. Lexicologists read hundreds of books, comparing the range of words and meanings that contribute to the sources of thinking from which our stories spring. Mathematicians studied the patterns of letters and words used to convey our thoughts. Authors’ pharmacy records were surreptitiously gathered to determine the possible effects of prescription drugs on fertile minds. After this exhaustive range of material was tabulated and collated, a group of learned scientists poured over the mass of pages and discussed its implications. Their final report was brief but concise. There you have it. The next time a reader asks where you get your ideas, you can speak with scientific authority. I listened to 20 or so pieces of music before deciding on one titled "Tectonic." It's from Kevin MacLeod's royalty-free music site called Incompetech. Let me know what you think of the video. It ain't Hollywood, but I think it's pretty nifty. Okay, bring the house lights down and cue the music. Some readers have commented that I must do an awful lot of research for my books. It's true, but that's a part of the job I really enjoy. I like to to do on-scene research as much as possible, though I may not describe things exactly as they appear. Since I set my books mostly in the Nashville area, I can visit sites as needed. With The Surest Poison, I made a couple of trips to Ashland City, the setting for the chemical dump and much of the story. We ate lunch at a small restaurant that looks like a diner out of the mid-fifties. I didn't use its name but described the decor in the book as a meeting place for Sid Chance and Jaz LeMieux. One spot near Ashland City I mentioned a couple of times is the Narrows of the Harpeth River. 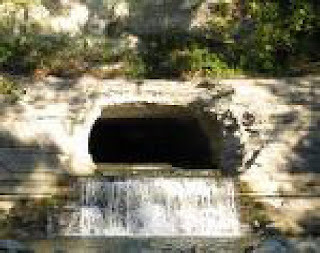 There Montgomery Bell built an iron forge in the early 1800s using slave labor to cut a 290-foot tunnel through limestone to provide water power. The photo shows where the water gushes out. I first saw this striking scene as a Boy Scout at the old Camp Boxwell, which was located nearby in the 1930s. The Ashland City Times was another spot I visited and described without using the actual name. I talked with a reporter and mentioned him in the Acknowledgments. A church member came up to me after reading the book and said her grandmother and grandfather had started the newspaper. She wanted another copy for the folks in Ashland City. Another town I used a few times is Franklin in neighboring Williamson County, one of the wealthiest counties in the nation (at least it was before the recession hit). I've been there many times but made a couple of visits to refresh my memory on a few points. I took photos of the main square, which I described near the end of the book when Sid and Jaz visit the local DA. Its main feature is a soaring stone monolith topped by a Confederate soldier. The Battle of Franklin in 1864 was one of the South's worst disasters. Six generals were killed or mortally wounded. My only reference to the Civil War involved that lonely Rebel atop the monument. Sid mused that the soldier's lost cause was long ended, and he knew the feeling. A body is found on page 2 of the book. I plunked it down in a spot familiar since childhood pre-WWII. The murder takes place in Shelby Park, a Metro facility that runs along the Cumberland River in East Nashville. I grew up not far from there and made many a visit in my day. They had a popular swimming pool when I was a kid. There are still ball diamonds, picnic areas, a golf course, and plenty of trees, green grass and roadways. A good place to dump a body in a rainstorm. 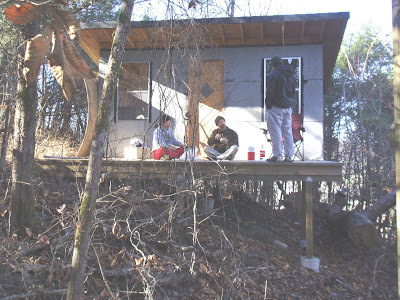 The story begins with Sid in his rugged cabin on a wooded hillside 50 miles east of Nashville. This location came courtesy of my younger son, Mark. A former Army Green Beret (though not in Vietnam like Sid), he loves the outdoors. Several years ago, he bought an 80-acre piece of property in Smith County. The community is called Pleasant Shade, but I call his place Campbell Mountain. It's a real chore to get to the top. He built a cabin near the crest of the hill, though it's not as commodious as Sid's. With some help from his two sons, seen above, he hauled all the materials up the hill via shank's mare. It included 4' x 8' sheets of plywood, 4x4 poles, and 40-pound bags of Quikrete. He has no electricity or running water. He also built a shooting range downhill from the cabin. I find research for my novels both interesting and nostalgic.